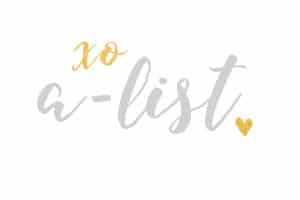 Here at A-List we love talking about the best parts of the sorority experience, but we also want to make sure those best parts are being felt by all of your members, all of the time. That means sometimes talking about the serious stuff…like hazing. Hazing prevention and awareness is incredibly important so we figured we’d give you some steps and ideas to help you coordinate a positive, hazing-free environment on campus for your new members as well as your peers! According to Google, hazing is the imposition of strenuous, often humiliating, tasks as part of a program of rigorous physical training and initiation. Sounds intense and somewhat self explanatory, but hazing is actually a bit more than what we see in movies and in the news. While hazing typically involves alcohol, it’s really considered anything that may make new members uncomfortable and asking them to complete tasks they wouldn’t typically feel comfortable accomplishing, whether it involves alcohol or not! Hazing at any level, no matter where on the spectrum, can cost your entire chapter! Chapters are removed from campus more often than we’d like because a small group of their members risked it all and made preventable mistakes! While this may sound harsh, it’s a reality you should share with your members! As you know, transparency and communication is key to successfully leading your chapter, and it should be no different when it comes to hazing. Have an open conversation with your active members before new members join your chapter. Set the boundaries and have your members sign anti-hazing contracts. Tradition is NOT an excuse! We all have those members who claim it’s their family tradition to welcome their newest members of their Greek Family. Teach your members the risks and the expectations to avoid the much unwanted hazing situations. And most importantly, hold your members to their contract! New members have also seen the movies and have been warned about hazing, so calm their nerves and let them know about your Zero Tolerance Hazing Policy. Often times, new members participate in hazing activities because they assume it is mandatory. Reassure them that this is NOT the case and that your chapter does not allow any form of hazing. Make sure they feel comfortable enough with their New Member Educator or the members of your Exec. Board to come forward if any type of hazing does occur. Hazing doesn’t exist only with Greek Life! Make your Greek Life Office and Dean of Students proud by planning a hazing prevention program. Partner up with another campus organization and make this event open to all members of Greek Life and even consider including students not in Greek organizations. Whether it’s as simple as tabling or a guest speaker in the auditorium, a Hazing Prevention Program can make a big difference! Here are our five favorite hazing prevention programs we love! Take the lead and help sponsor one of your campus events or plan your own and be sure to encourage your members to attend all hazing prevention events. National hazing prevention week is the last week in September so when better to implement some of these programs! To read more about National Hazing Prevention Week, click here. Who doesn’t love a little friendly competition? Hazing Prevention can be fun too! Ask your fellow Greeks to make a hazing prevention and awareness video. The chapter with the most views and shares will win a prize! Feel free to work with your campus’ Greek Life Office or Panhellenic Council to help you out. Invite an influential guest speaker on campus. Whether it’s the campus’ favorite officer or an influential alumni, a speaker can make a major impact and help avoid those unwanted cases of hazing on your campus and in your chapter! We all as college students are on social media constantly. 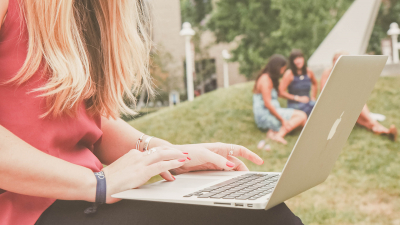 If you don’t feel confident enough to start an in-person campaign, start a social media one! There’s so many great anti-hazing sayings out there that bring awareness to the issue. 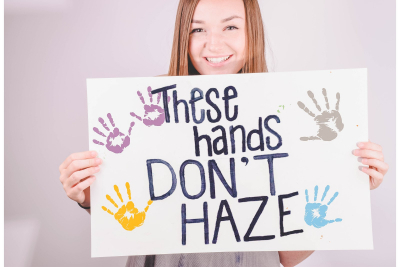 Ask your members to pose with a “These Hands Don’t Haze” sign, post it on their socials and tag anti-hazing or hazing awareness articles so people can get more information! We’ve linked a really helpful guide from hazingprevention.org that not only explains all the different forms of hazing but also gives even more awesome program ideas. Host a roundtable discussion with the Greek Life Office. Mix it up and make it a bit more relatable by including a number of campus and chapter leaders as the discussants. Have them share their new member experience, all the great things about Greek Life and why hazing prevention and awareness is so important! 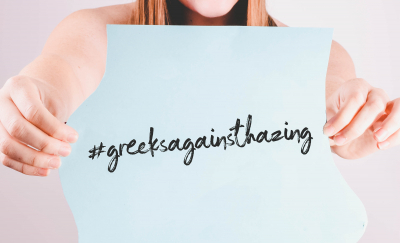 Table to spread awareness during Hazing Prevention Week and encourage all Greek members to sign a pledge against hazing and write what healthy membership experiences mean to them using the hashtag #greeksagainsthazing. The chapter with the most participants are given a prize. This can even extend to non-greek members, just take out the greek in the hashtag and supplement your universities name. To see some of these programs implemented on real campuses, the University of Connecticut has a full events list of their National Hazing Prevention Week schedule and it’s goals. If your campus doesn’t have events similar, take the initiative and plan them yourself! 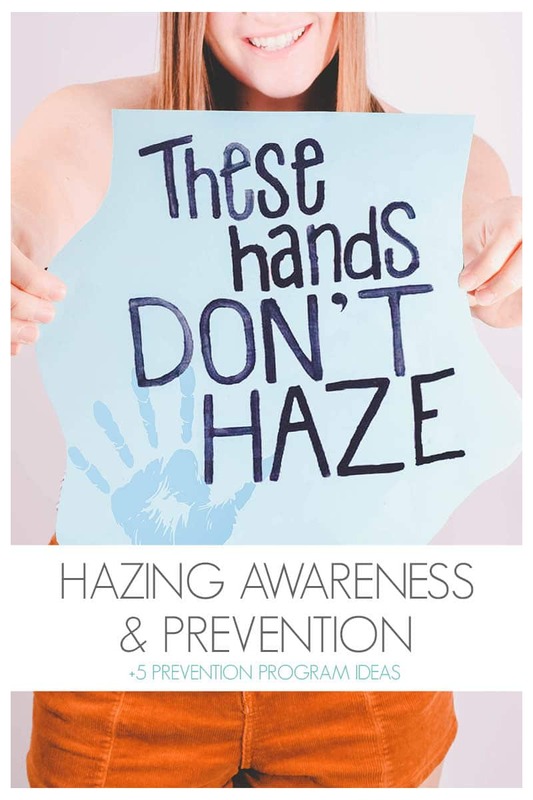 Hazing IS preventable and your chapter CAN make a difference! Want to see your chapter’s hazing prevention program featured? Send us your hazing prevention and awareness plan and we will give you a special shoutout and add it to our list of hazing prevention programs! This entry was posted in Members Only: A blog for chics and Greeks alike. and tagged #greeksagainsthazing, Greek Life, Greek Life Tips, hazing, national hazing prevention week.